A block puzzle game featuring characters from Yoshi's Island. Rows of coloured blocks rise from the bottom of the screen. Using the cursor, you have to switch horizontally adjacent blocks to create horizontal or vertical lines of three or more of the same colour. Matched blocks vanish and any blocks above them will tumble down. If the stack of blocks hits the top of the screen then it's game over. 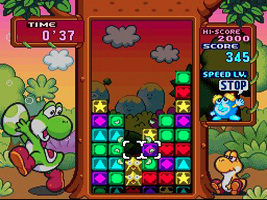 The game features an Endless Mode, a Story Mode where Yoshi must free his friends by beating them, and a Puzzle Mode, where you must clear all the blocks within a certain number of moves.